Initially this show was called Valerie and then Valerie's Family and later as The Hogans (very strange). Apparently it starred Valerie Harper first and then she got killed off and they brought in Sandy Duncan. But anyway does anyone remember this? The funny thing is that I was sitting on the couch the other day and I was looking in the TV planner what was on next. It Said The Hogan Family which meant absolutely nothing to me. I got on my computer but left the TV on and all of a sudden I heard the theme intro and straight away something in my brain clicked with recognition and looked at the TV and instantly recognised it. Yes, I used to watch this show but it had been so long (over 20 years) that I had completely forgotten about it. It must not have been re-run on TV here either. Plus there were a number of other intro's too with transitioning titles. 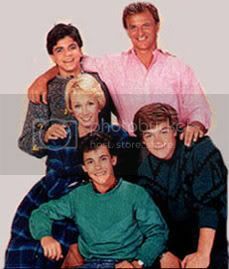 I only remember watching this show with Sandy Duncan though. I guess I was too young for the Valerie Harper years or something. Surely someone here must have seen this? I have seen a couple of Episodes on Youtube, and i liked it...I would Definitely buy it, if they put it on DVD. The father was a pilot, no? I remember watching this when Valerie Harper was on, but I think I disliked it with Sandy Duncan. Didn't she play Valerie's sister who comes to live with the family and take care of them? I have never seen this in reruns. I'll have to look for it on YouTube.